I have always been in tune with and in awe of natural cycles – how the moon, the tides, and the seasons are guided by these universal forces. 4STM™ takes universal principles found in nature and applies them to working out in a way that will promotes overall wellness. The 4 Seasons Training Method is a workout, sure. But 4STM™ is also designed to prime your mind, transform your body and elevate your spirit. The 4 Season Training Method is a year-long process, broken into 4 training seasons of smaller weekly workout life cycles, each roughly 12 weeks long. We believe that in fitness, just as in life there are seasons of activity and seasons of rest; seasons where you need to push yourself, adapt and grow. 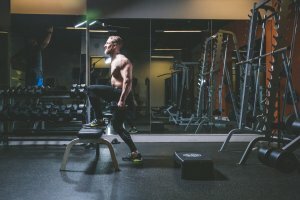 That’s why the 4 Seasons Training Method is uniquely tailored to each client’s specific fitness goals, within the training framework. Each season starts with an introductory week and ends with a transition week between seasons, but no two clients’ workout seasons are identical. Each training session follows the same four steps, but you’ll never get bored because training sessions are never the same. Our trainers are constantly redesigning sessions based on client goals, condition, and progress. I designed the 4 Seasons Training Method for all bodies, and have trained everyone from Yanislav, an Olympic athlete, to David, an 80-year-old skier! Most importantly, we do what we do for a reason. When you work out with one of our trainers, we want you to know that your fitness matters to us, because we truly believe that 4STM is a total way of living, being healthy, and just feeling good about your mind and body. I believe that mind, body, and spirit are essential. Physical training isn’t just about transforming your body; it’s also about changing your mindset and lifting your spirit as well. That’s why, during the 4 Seasons Training process, our coaches focus on teaching clients how to mentally challenge themselves, and how to apply that as a holistic approach to fitness and wellness. This is how I came to love fitness. When I started working out, I experienced not only a physical transformation, but my inner spirit changed as well. I was happier and more fulfilled, and I saw positive changes in my daily life. We believe that no matter the season you’re in, whether it’s a high or low, you can completely transform your life with 4STM. Training body is not only changing our bodies but our minds, it lifts our spirit as well. So there is the mental part – how to set our minds, how to get ready for it, then is the technical part – how you perform that, then there is the nutrition part what nutrition is and how should we look at it… The mind is the most important and that’s why we teach people to focus on positive and see small daily changes, to be careful with their self talk and express themselves positively. When you get your mind ready and execute with your body and start developing your body other things happen, you grow stronger not only physically, but mentally, you start believing in yourself and ultimately got for other things outside of the training itself. So we set our minds, we prepare our bodies, we feed our spirits and its a cycle, we grow them all and in different times and aspects of our lives they serve us differently. It happened to me and it happens to many people I know. I know it works, I’ve witnessed it. I am a big believer in the importance of the spirit. The energy that we project and reflect can literally change our world. If there is anything that made me who I am and allowed me to succeed, it is my spirit. It is vital that we take care of our spirituality, take time to relax, meditate, and breathe, so that we can get in touch with our true selves. Are you throwing money away when you hire a personal trainer? Their Instagram posts look cool, but how do you choose the perfect personal trainer for you?